Moyea SWF to MPEG Converter is a professional and easy-to-use program for converting Flash SWF to MPEG (VOB& MPG) video files compatible with DVD, VCD and SWCD for playback on your DVD player. Additionally, this program also supports to convert SWF to audio files like MP3, AAC, WMA, WAV audio files for CD. This SWF to MPEG converter output great quality after converting SWF to videos and audio files. For it costs less and has perfect performance for converting SWF to MPEG, and ripping SWF to MP3, AAC, M4A, WAV, WMA audio files. With its user-friendly and graphical interface, Moyea SWF to MPEG Converter offers simple and swift solutions to head-ache problems in converting SWF to MPG videos, such as audio distortion, loss of frames, audio and video asynchronization, meanwhile, this program could process the embedded or linked FLV in SWF files. 1. Synchronization of video and audio--This SWF to MPEG Converter enables users to achieve accurate audio and video synchronization with its Lower-Playback-Speed technology. 2. Smooth sound with high quality--Moyea SWF to MPEG Converter gets the audio not by recording it but by extracting the audio from a Flash file. Extracting the audio data can ideally retain the original audio effects in the generated video files. 3. Accurately keep the original playback speed--With the technology of Lower-Playback-Speed, there is no need to add or cut off frames and the original frame duration can be kept perfectly. 4. Audio recording and ripping function-- This program makes it possible for you to rip audio data of SWF file to another independent file while converting SWF to a video format. Process embedded FLV or linked FLV and convert interactive Flash. Moyea SWF to MPEG Converter makes the flash enjoyment on home DVD/VCD/SVCD player and on internet via YouTube just a click away. With it, users can easily convert flash SWF to MPG, VOB, TS, etc, which can be played on DVD players for entertaining or uploaded to video sharing websites for broadcasting. How do we review and rate Moyea SWF to MPEG Converter? Moyea SWF to MPEG Converter adopts the technology of Lower-Playback-Speed while converting so as to both extract the audio and covert the video at the same time. Therefore, with our program, the synchronization issue does not exist at all regardless of your computer system configuration so that you can achieve accurate audio and video synchronization. By using the method of Lower-Playback-Speed while converting and adjusting the speed according to different computers, our program does not lose any frame, does not change the duration of any frame and can perfectly process most complicated Flash files. By doing so, Moyea SWF to MPEG Converter properly realizes the WYSIWYG principle in the Flash to video conversion. In addition, this program makes it possible for you to rip audio data of SWF file to another independent file while converting SWF to a video format. The supported audio format includes MP3, AAC, M4A, WMA, WAV, etc. Besides recording and ripping, you can also convert SWF file to a single audio file. Moyea SWF to MPEG Converter gets the audio not by recording it but by extracting the audio from a Flash file. Extracting the audio data can ideally retain the original audio effects in the generated video files. 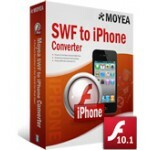 Besides, Moyea SWF to iPhone Converter can extract or rip the audio data from the source Flash files and generate independent audio only files for PSP, iPod, etc. With its user-friendly and graphical interface, Moyea SWF to MPEG Converter offers simple and swift solutions to head-ache problems in converting SWF to MPG videos, such as audio distortion, loss of frames, audio and video synchronization, meanwhile, this program could process the embedded or linked FLV in SWF files. Moyea SWF to MPEG Converterhas provided multiple ways for technical helps such as sending E-mail, going to the Forums, checking Tutorials, Website FAQs, Live chat, online contact or telephoning the support group. how to use Moyea SWF to MPEG Converter?